OTOY partners with GPU path tracing renderers Octane and Brigade! Wowowow... this is superawesome news! An article on Venturebeat today revealed that OTOY will be partnering with two fantastic renderers, Octane Render from Refractive Software and Brigade from Jacco Bikker, both pioneers in interactive/realtime high quality GPU based rendering. This new partnership means that there is now a very high concentration of high-quality rendering know-how and I've got a feeling that there will be more to come. This will have a profound impact on the movie/game/rendering industry... I'm extremely happy and excited to see what's coming from all this :D.
I've been working on some new real-time path traced demos during the past week involving physics, driving and shooting, three popular ingredients in action games. The demos will be bundled under a new 3 letter acronym, i.e. UPG (GPU in reverse), which stands for Unbiased Physics Games. 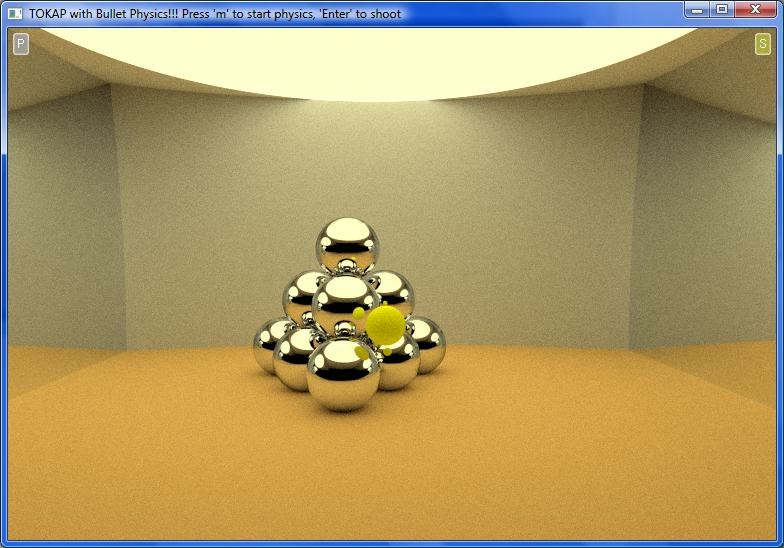 Both games use the GPU path tracer developed by Jacco Bikker for the Simplex Paternitas demo. The videos were recorded on a GTS450 with 16 samples per pixel (which already offers very good image quality with little noise) at a resolution of 640x480. 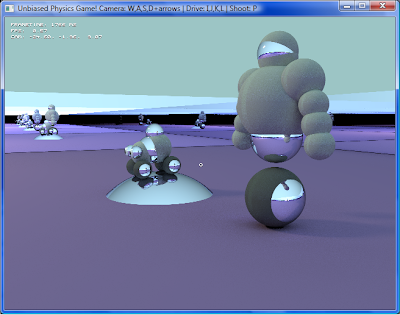 The robot and car in the second demo are both encapsulated by a "hitbox" (an axis aligned bounding box to maximize the path tracing performance), which position is updated every frame. I'm going to implement a movable and "shootable" light hanging from a chain, which should create dramatic shadow effects. Some basic AI path finding code so the robot starts chasing and shooting the user-controlled car might also be an option. Still thinking about implementing oriented bounding boxes which would enable some cool collapsing structures. Plenty of ideas still and new ones are coming every day, there's just not enough time to execute all of them :) On the rendering side, I think I'll shift the geometric focus of the demos to triangle meshes and two-level BVH or grid, because there's only so much you can do with spheres and boxes - even though they're relatively cheap to intersect. I've also tried porting the code to OpenCL with the recently released OpenCL1.1 drivers from Nvidia but the OpenCL kernel refuses to build for some reason and there's no easy way to find out what's causing the error. It will take some time to get this right. 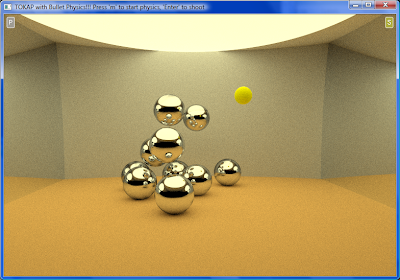 Ray tracing in CryEngine 3! Unbiased Truck with Plausible Bullet Physics! The physics in the previous demo were funny and also a bit strange, because the chassis dove down when the wheels were going up. I discovered that the Z-angle of the chassis had to have the same sign as the Z-angle of the wheels, which gives a much more plausible result, although the wheels are still quite jerky and are jumping around because of the loose suspension. The car will pull itself to its original state in most cases, so I've decided to leave the wonky physics as is. Some people reported problems with the last executable, so I included an updated version of "cudart.dll" this time (the CUDA 4.0 version). Unbiased Truck with Bullet Physics!! After lots of trial-and-error, I have finally implemented car physics in the real-time path traced Unbiased Truck demos. Bullet doesn't like it when physical objects are not placed according to Newtonian rules, which has caused some unexpected behaviour and crashes. The Bullet SDK provides a vehicle physics example with parameters for wheel friction, suspension, chassis stiffness, etc. The "car" consists of a rigid chassis with four independent wheels. Matching the physics world with the rendered world took some time to get right: for example, since each of the four wheels can move independently from each other and from the car chassis, each "rim" had to match up perfectly with its respective wheel. Crashing the car into the walls is just plain fun. When hitting a wall, the car seems to disintegrate at first, after which it pulls its wheels and chassis together again. 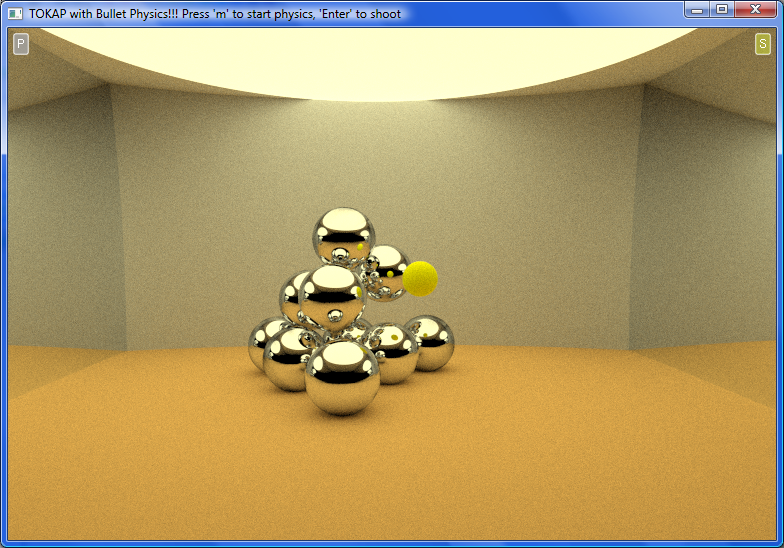 I always like a nice real-time ray tracing demo, especially when it involves physics. Evan Wallace released a very impressive WebGL demo featuring real-time raytraced water with caustics and physics (waves, buoyancy). John Carmack: "Eventually ray tracing will win"
"I expect, as we look at next-gen console and broad enough adoption of PC stuff, that there will be some novelty games that are all raytraced or all voxeled on there. But when you look at the top end triple A titles, I do not expect that transition happening in that timeframe but I keep looking at it. There’s a lot of these things that we look at every five years on and on and eventually… you know I do think that some form of raytracing, of forward tracing or reversed tracing rather than forward rendering will eventually win because there’s so many things that just get magically better there. There’s so much crap that we deal with in rasterisation with, okay let’s depth fade or fake our atmospheric stuff using environment maps, use shadows. And when you just say “well just trace a ray” a lot of these problems vanish. But one interesting thing that people say “look real-time raytracing on current hardware”, that’s what I did in OpenCL recently and I did some interesting work with that. But the real truth is, you don’t just trace one ray it goes sixty frames per second. To do the things that people want to see out of ray tracing, you’re gonna need to trace a dozen rays on there if you want your soft reflections or even sharp reflections if you got bump mapping on there and not to look like a mess of noise on there, you start needing an order of magnitude more rays than that. And most people still avert their gaze from the whole problem of dynamic geometry. There’s some interesting work that goes on with very rapid GPU assisted KD tree construction that’s starting to look at some of that, but it’s still a long ways off. It’s always the problem of fighting against an entrenched incumbent where we’re doing polygon… Vertex fragment polygon based rasterizers are so far and away the most successful parallel computing architecture ever it’s not even funny. I mean all the research projects and everything else just haven’t added up to one fraction of the value that we get out of that. And there’s a lot of work, lots of smart people, lots of effort and lots of great results coming out of it. 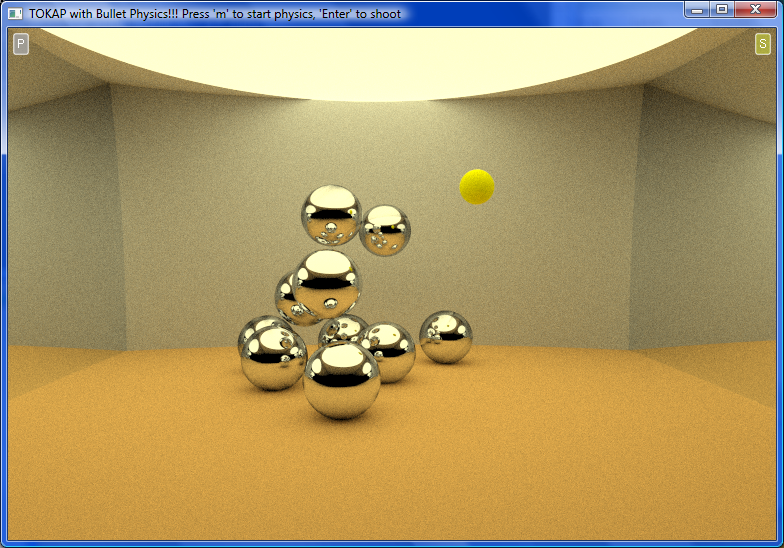 Eventually ray tracing will win, but it’s not clear exactly when it’s gonna be." 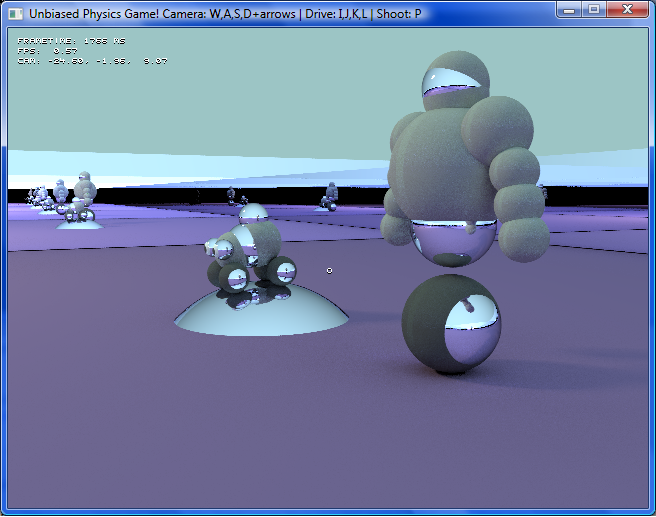 "On the topic of ray tracing, a frequently debated issue on PC Perspective, Carmack does admit to finding its uses quite surprising and has spent some time building ray tracing engines for development testing. He seemed surprised by the results in his initial attempt to replace rasterization with a ray tracing engine, getting as much as 60 FPS at 720p resolutions on a Fermi-based NVIDIA graphics card. When performance dropped below the targeted frame rate he was able to either produce an image of a lower resolution and display that or use previous frames to sort of “blend” them for a smoother image. The issue though is the delta between a tech demo and fully implemented gaming engine – demos deal with static models, there is no character animation, etc. And while the fact that it runs at 60 FPS at 720p sounds impressive, if you were drawing that with a traditional rasterization engine it would be running at 1000 FPS!" The photoreal lighting of the scene is much more obvious in this video (less noise, higher framerate and higher resolution than the previous vid which was rendered on a 8600M GT) Unfortunately Youtube puts a nasty filter over the image, the original image quality is much crisper. After much tinkering with the Bullet code (converting quaternions to degrees) the car physics for Unbiased Truck Soccer are finally working (just one car atm, but it looks hilarious), so I'll be posting a new demo and video soon. Just found this: http://gpgpu.org/2011/08/04/centileo-out-of-core-ray-tracer I wrote about this amazing out-of-core GPU path tracer (which will be presented at Siggraph this week) before (see http://raytracey.blogspot.com/2011/04/centileo-brand-new-interactive-out-of.html and http://raytracey.blogspot.com/2011/06/update-on-centileo-out-of-core-gpu-ray.html) . 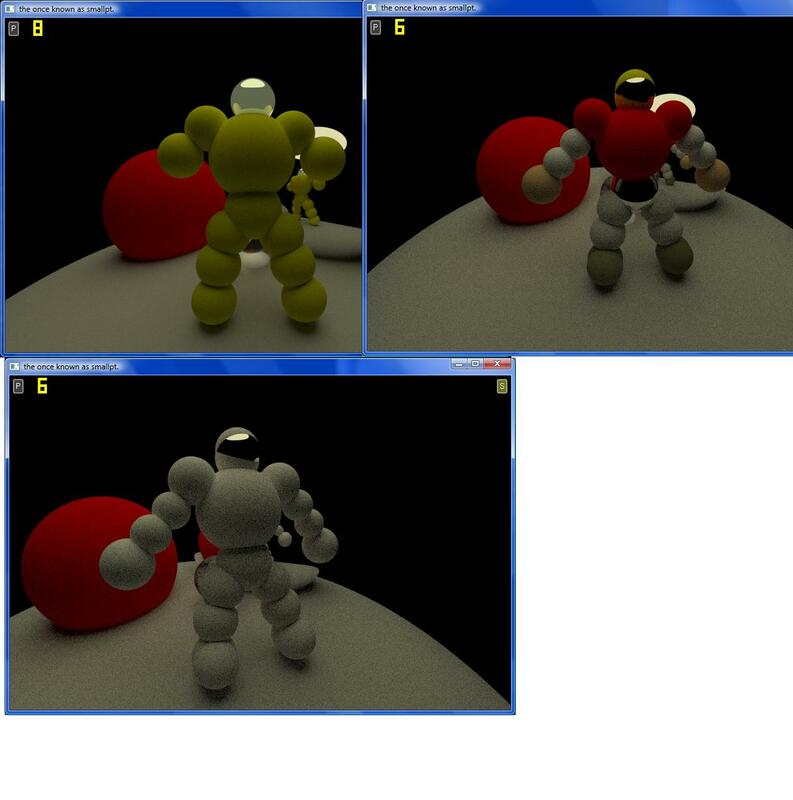 "CPU-based rendering solutions (even many-core, e.g. 16-core) are much slower than our GPU-based software (around 25x slower). Such 16-core CPUs are 3-4x more expensive than our GPU." "The target of CentiLeo development is to move all the flexible rendering related tools from slow and expensive CPU-based rendering solutions to new innovative GPU-based solutions. - to integrate our accelerated individual rendering stages into existing rendering solutions and pipelines in various industries such as engineering design, architecture, movie industry, visualization and etc." 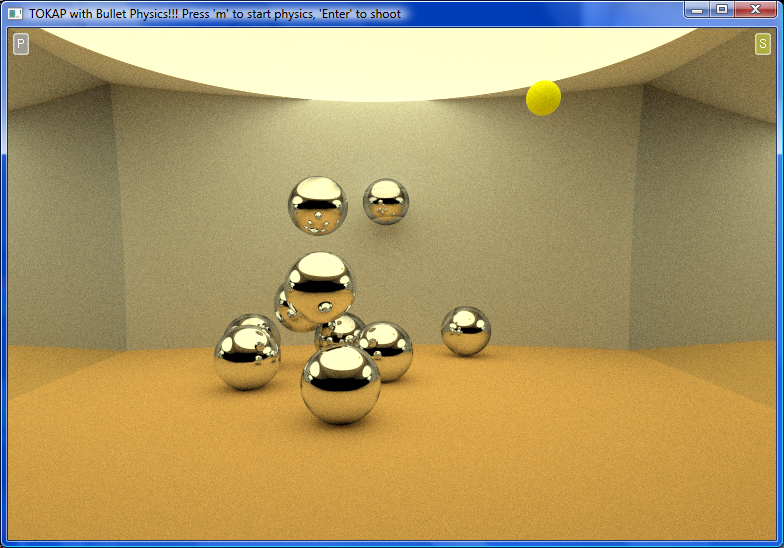 A physics based demo without user interaction with the physical objects in the scene is only half as fun, so I've been working on a little physics based game where you can shoot a ball into the scene and hit physics objects. It's not a real game, it's just mindless fun and the graphics are as good as photoreal. - shooting mechanics: fire a ball into the stack or try hitting a bouncing sphere by pressing 'Enter'. The ball is shot from the current camera position at the current view target in the center of the screen. Due to performance reasons, only one ball is shot at a time (the same ball is 'recycled' with every shot). Make the physics go berserk! Celebrating the third anniversary of this blog (first post on Aug 1, 2008: http://raytracey.blogspot.com/2008/08/ruby-voxels-and-ray-tracing.html) Cheers!